Here at DePaula Chevy, we have an extensive selection of dump trucks for sale for those looking to take their work to the next level. Whether you’re in the construction, landscaping, tree removal, or any other field that hauls material from one location to the next, a dump truck is perfect for you. 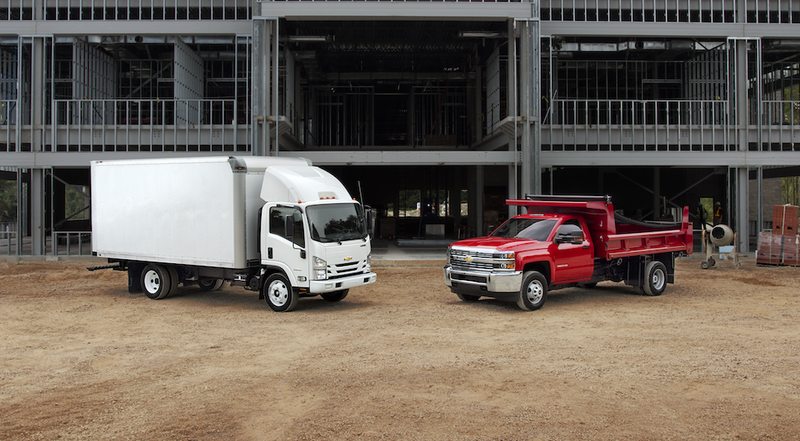 That’s why we have Chevrolet work trucks ready and raring to go, with dump bodies already installed. These aren’t ramshackle dump bodies either. Rather, they’re dump bodies from well-known brands that we trust, like Air-Flo, Reading, and Rugby. Don’t just think a certain trade will benefit from a dump body, because a dump body can be used for many different trades. More than you might think. Also, they do much more than just make your life easier at the job site; with many of the advantages they provide unique to a dump truck. Whether you’re looking for a full dump body conversion or a dump bed insert, DePaula Chevy can get it for you. We can even install a dump body if we don’t have one of our work-ready trucks in stock, which means we’ll always have something for everyone. Chevrolet didn’t get its legendary reputation in the truck world overnight or from the trucks that were just used as daily drivers. Instead, the legacy is rooted in providing reliable, durable, and long-lasting workhorse trucks. Trucks like the Silverado (1500,2500,3500), and the Low Cab Forward (LFC) truck that’s been manufactured for GM by Isuzu for many years. We have these trucks on our lot sitting at job ready status, or at soon-to-be job ready status. All you have to do is ask. The Silverado is known as the longest lasting pickup truck on the road, which is why DePaula Chevrolet has no issue making it a work-ready truck with a dump body. We know the Silverado can handle it, especially the Heavy-Duty 2500 and 3500 models. But, if so desired, we can get dump bodies for the Silverado 1500. While it can’t hold or tow as much as a 2500 or 3500 Silverado, it can still hold its own in certain trades. For the construction and commercial landscaping trades, you’ll often find that a 2500 or 3500 Silverado is a better choice. After all, a larger payload means the truck is able to hold more material in its bed. Effectively, this means more material moved, and more material dumped at a faster pace. They may not look like it, but Low Cab Forward (LCF) trucks make great dump trucks. Their sheer mass means they’re able to effectively carry heavy payloads , and their long body provides even more room for longer materials that wouldn’t fit in a shorter truck like the Silverado. Plus, they have a cab over design. A very welcoming design, since it’s able to provide the driver with optimal visibility. This is helpful for plumbers or construction contractors who might have to navigate into tight, urban areas. Allowing you a sweeping view of objects, vehicles, and people that would otherwise get lost in front of a traditional large-truck front-end. More importantly, ease of access to the engine compartment — thanks to the flat front — means you’ll have an easier time doing maintenance or repairs. Regardless of which trade you’re in, DePaula Chevy believes that you deserve the best. That’s why we only deal in dump body brands that we know and trust. A few of the brands we are proud to have on our Silverado and LCF models are Air-Flo, Reading, and Rugby. The mission of Air-Flo has been to make the lives of hard-working men and women easier. It all started in 1940, when the company was looking to automate the old style of manually harvesting onions. In order to achieve this, they developed (and patented) a mechanical harvester. It used the unique “air flow” principal. It wasn’t until 1960 when the company ended up moving into the manufacturing of truck equipment, breaking into the segment by introducing ice spreaders. By the 1980s, they added dump truck bodies; and are now renowned as one of the most trusted, innovative, and high-quality dump body suppliers in the industry. Industry-leading standard features and exclusive options are what come to mind when you think of Reading dump bodies. Whether you are in the construction, excavation, masonry, or tree-work industry, Reading is a big name. Established in 1955, they introduced the service/utility truck body concept to the construction industry, which means their roots grow thick when it comes to work trucks. They are now one of the largest truck equipment manufacturers in the United States, and all their products are made in the USA. If you’re looking for the country’s leading designer and manufacturer of Class 3-7 dump truck bodies, then one of our job ready trucks with a Rugby dump body is for you. Founded in 1969 as a small agricultural equipment manufacturer, they are now considered to be a cutting-edge truck equipment expert. Their dump bodies can be seen all over the place in construction sites, and some say they’ve set the standard for carefully engineered and high-performing dump bodies. Thanks to the prestigious history and reputation of numerous dump body brands found on our trucks, we guarantee that you’ll experience nothing but quality, regardless of what brand you end up with. What Trades Do Dump Bodies Work In? Having a dump body on your work truck not only provides numerous advantages, but it also opens up a whole new level of versatility that you never knew your work truck had. If you’re in the construction field, a dump body is necessary. Not only is it easier to remove materials from the bed with a dump body, but it also makes removing large rocks and stumps — that can only be lifted by a machine — possible. When landscaping or in the excavation business, dump bodies are helpful when it comes to transporting material. Instead of shoveling it out by hand, all you need to do is press a button (or pull a lever) when you get to the site where you’re putting loose material. Essentially, any trade where you need to move loose or cumbersome material benefits from having a truck with a dump body. The most obvious advantage a dump body provides is how easy it is to unload material. Instead of having to remove loose material by hand (which can take a long time, depending on how much there is), you’re able to let the dump body take care of it in a much quicker way. This snowballs into the next advantage: less time. As a tradesman, you know that money equals time. The quicker you can move from job to job, the quicker you make money. If you cut out the time it takes to remove the material by hand, then you’ll get jobs done in twice the time it would take before you had a dump body truck. It’s also a much safer way to move materials. Even something as simple as dirt could cause a serious injury on the job site. Imagine jumping into the back of the truck to shovel out dirt, then missing a step and hitting your head on the ground. Furthermore, you’re able to remove heavy objects (like stumps and boulders) safely. Instead of worrying about fitting six guys in the back of the truck to remove a stump, just dump it out. Convenience, efficiency, safety: this is what a dump body is able to provide you with in your line of work. Whether you’re looking for a flatbed dump body, a dump body for a Silverado, a dump body for a LCF, a dump bed liner, or a vehicle with a full body conversion, DePaula Chevrolet in Cincinnati, OH can get it. Our work-ready trucks make it possible to buy a truck and go back to work the same day. Our connections and knowledge on Chevy dump trucks even allow us to install the type of dump body you want on one of our new models. The possibilities are endless. Our help doesn’t stop there. We can even do in-house repairs on your dump body or truck if something gets damage on the job site. What’s more, we can also get graphic work done on your truck. That means you could have your business logos on your doors, hood, or wherever else you decide. It’s like a rolling billboard, and makes your fleet of work vehicles actually look like a fleet. Presentation is key, after all. That’s why we make sure to sell all of our new job ready trucks in the best-looking condition (and quality) possible. So if you’re in the market for a dump truck to make your life and your job easier, then make DePaula Chevy your next stop.